With long and never ending ATM and bank queues… if you got up in the morning with the determination to get hold of the cash and yet there are 100s of faces standing ahead of you, all with the same determination and zeal, here’s counting ways to keep you upbeat and ways to utilise your time in the queues. Put your smartphone to good use with these selective apps, serving the best of entertainment, networking, fashion discovery and a lot more. nexGTv: Missed your favorite television show? Video on Demand and Live Mobile Tv entertainment apps like nexGTv can come to your rescue. 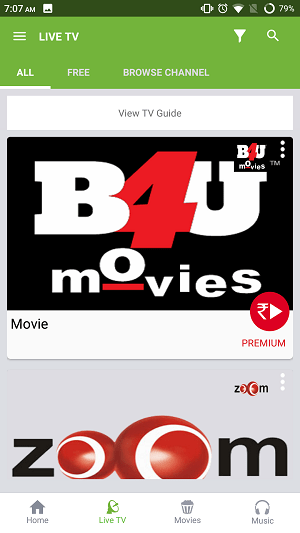 Streaming over 100+ LIVE TV channels, Hollywood Movies, Bollywood movies, Bengali movies, Marathi movies, Tamil movies, Cricket, Tennis & Sports Highlights, Music Exclusives, Bollywood Songs, Reality TV Shows, and Videos on Demand on your Mobile TV; this Mobile Entertainment app has taken Mobile Live TV streaming, Live News on Mobile and Online Video viewing experience to the next level. Rooter: Ever wondered how it would be like if there was a way to find people you don’t know with similar sport interests around you? A person supporting the same team or supporting the same player living around your work place or home? Isn’t it boring to sit back at home and watch matches alone? Offering a chance for sports fans to connect with one another across real and virtual worlds, Rooter is a first-of-its-kind, mobile-based platform that helps users engage with others sharing their passion. 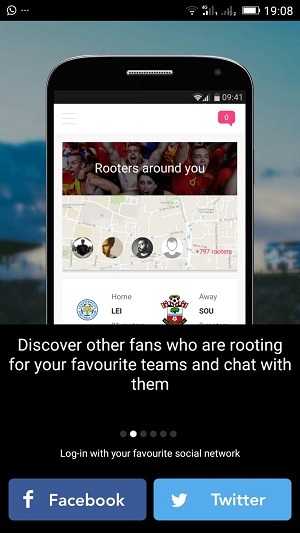 With its focus on smart technology and, Rooter takes sporting interactions beyond generic social media platforms and fantasy sports by allowing fans to connect through pre-match quizzes and chat forums, unique Live match prediction games and post-match interactions in order to share their insights, predictions, analysis and opinions of the game. Let’s change the way you follow sports with Rooter and you might discover the next person standing behind you also turns up to be a Manchester United FC fan. Fashin: Watched a superlative video on YouTube and fell in love with the styling? Fashin makes it easier for you to get the exact same styling by extracting clothing. 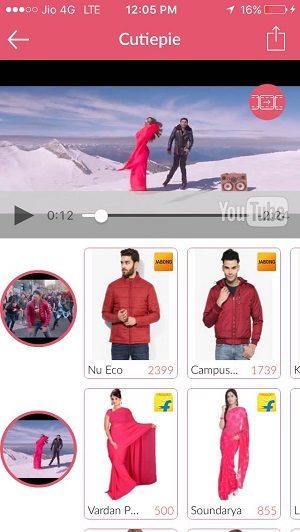 The app further lists every fashion ecommerce portal providing the exact same item (jacket, jeans, tops, skirts etc) and the prices, hence also offering price comparison in a jiffy! Upgrade your wardrobe with the latest Bollywood styling and fashion trends! From the recent sensational & stunning album of Ae Dil Hai Mushkil to going back till 2014, Fashin today has over 1000 YouTube videos listed for your personal styling. How about humming along to your favorite tunes while styling yourself ahead of the ultimate seasonal festivities and the soon approaching wedding season? Give Fashin a decko now! After downloading the app, users can take hold of the fashion trends in Bollywood music, take Katrina’s lehenga or John Abraham’s cool T-shirt for instance. The app will provide users with different options where the exact same or similar outfit is available, compare the prices and make the entire buying process completely effortless for the users. What more! You can even click a picture of the outfit that you liked of the person standing in front of you, upload it on Fashin app and discover where you can find the same outfit on all the fashion e-commerce website. 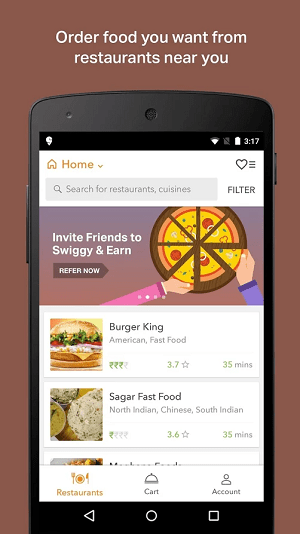 Swiggy: Hunger can be really annoying sometime and it can even get worse while you are at the queue waiting for your turn to come up for more than an hour. You can order food online using apps like Zomato and Swiggy from almost any restaurant and tame your hunger beast! SHAREit: If there’s one way Indians are sharing photos, videos, music, installed apps, or any other files while still saving on their “precious data”, it is through SHAREit. 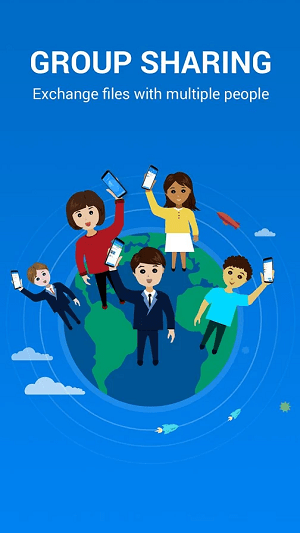 In December 2015, SHAREit. crossed 100 million local downloads – an indication of how big the app is for smartphone users in the country. In fact, with more than 600 million registered users worldwide, it is one of the most preferred apps for cross-platform sharing across the globe. None The less if you are even bored discovering all of these amazing apps, you still have the option of playing these awesome android games like Candy Crush, Temple Run, Clash of Clans, PlantsVsZombies or Asphalt 8 racing. Quick tip: carry your charger or power bank, just in case. 5 Coolest Mobi-Series To Watch Out For!